Synopsis: It only takes one person to start a revolution. The extraordinary story of Steve Jobs, the original innovator and ground-breaking entrepreneur who let nothing stand in the way of greatness. The film tells the epic and turbulent story of Jobs as he blazed a trail that changed technology — and the world — forever. If someone were to make a list of the most important people of the twenty-first century, there is no doubt that the name Steve Jobs would have to be on it. Not only did he revolutionize the personal computer, but even the most pro-PC person most likely has some form of Jobs-technology in their possession, whether it’s an iPod, iPhone, or iPad. One would think that a movie about such an influential man would be interesting. If that movie is Jobs, one would be wrong. Just as the title implies, Jobs is the life story of Steve Jobs (Ashton Kutcher from “That ’70s Show” and No Strings Attached), from college dropout to one of the most successful entrepreneurs in history. The film shows his formation of Apple Computers in his father’s garage and his rise to the top of the technology world, culminating with his battles with Microsoft and the internal struggles which eventually oust him from his own company. It’s a typical Hollywood rags-to-riches story, with an epilogue of flying too close to the sun. Director Joshua Michael Stern (Swing Vote) takes the wrong approach to Jobs. Instead of humanizing Steve Jobs and turning him into an anti-heroic martyr, Stern concentrates on the paranoid perfectionist that demanded more from the people around him than they could possibly deliver. 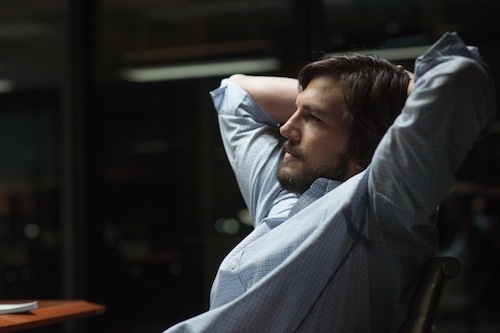 Ashton Kutcher’s Steve Jobs is not likeable at all, so the few obligatory scenes that could potentially generate sympathy with the audience are completely ineffective. To Kutcher’s credit, he does attempt to give an arc to the character, but the Jobs that appears onscreen at the beginning of the film is too similar to the one that appears at the end – despite all of the things that happen to him, he is unchanged, and that makes for a bland, connect-the-dots movie. Throughout the movie, the audience is force-fed Apple advertisements, from Jobs’ introduction of the iPod in the film’s first scene to the endless supply of Apple logos that permeate every scene of the film. The film even cleverly shows classic Apple television commercials, including the legendary 1984 spot, in the background. The film is as much about Apple Computers as it is about Steve Jobs, but Apple ends up looking a lot better than Jobs does by the end. 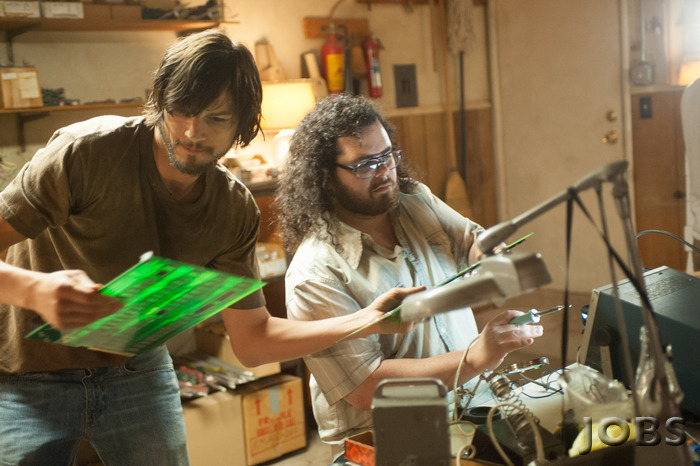 As a biopic, Jobs only shows the business side of the man, which is part of why the character comes off so poorly. The opportunity to expand the story does present itself; there are half baked and unfinished subplots involving Jobs’ family life and his loyalty to his original team that could have helped to paint the man in a less robotic light. However, the story doesn’t let the focus shift from the ruthless businessman, and the character ends up one dimensional and shallow. And a one dimensional and shallow title character leads to a one dimensional and shallow movie. The result is an overwrought melodrama that is reminiscent of a Lifetime Network cable television movie. Watching Jobs abuse the people around him isn’t entertaining, it’s disheartening. Jobs is screenwriter Matt Whiteley’s first produced movie, and his inexperience shows. The story follows the events of Steve Jobs’ life, but doesn’t inject any drama or conflict into it. There are minor sections of strife, but nothing really catastrophic enough to raise the stakes and really grab the attention of the viewer. The lack of anything real happening makes the film drag on and on. Whiteley’s ear for dialogue is lacking as well; every character has the same voice, one that would feel right at home in an afternoon soap opera. The conversations are laughable, and not in a positive way; sometimes, it’s a wonder that the actors themselves don’t start cracking up from the silliness. 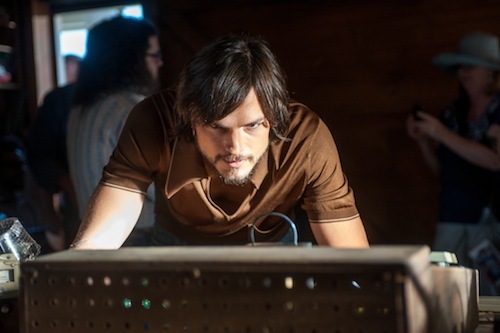 Even Steve Jobs, the central figure in the movie, comes off as superficial and stale as written, despite Kutcher’s attempts to inject a little life into the man. In the end, it just seems as if Whiteley is in over his head with his screenplay for Jobs. The one thing that makes Jobs even a little fun to watch is the production design. Spanning the decades between 1974 and 2001, the film is a veritable time capsule of technology and style. Production designer Freddy Waff (The Social Network) and art director Bruce Robert Hill (Starship Troopers) do a good job at recreating the early days of Apple Computers, digging up old Apple II and Apple Lisa computers as well as throwing together prototype-looking devices to fill up the lab tables. There is a fun, kitschy fascination with the old technology that is destined to inspire giggles and smiles from those who remember the infant days of computing fondly, particularly when the film briefly recounts Jobs’ time at Atari and shows classic videogames like Breakout and Asteroids. The only drawback to the production design of Jobs is that it’s not at the forefront of the movie; as most production design is, it sits in the background and does not call attention to itself. However, in a movie like Jobs, where the art direction is the most interesting aspect of the film, it should probably be emphasized more in an attempt to distract from the actual story.